Mississippi State played this game at Mizzou Arena on Saturday night without their leading scorer Gavin Ware, who was averaging 15.9 points per game for the Bulldogs. It turned out just fine for the visitors, who adjusted by using zone defense to baffle the Tigers in a 76-62 final. Head coach Kim Anderson would not concede that the Bulldogs switching to a zone defense to make up for lack of depth was the reason his team loss. “We just weren’t aggressive enough getting the ball inside against the zone,” said a dejected Anderson after the game. Mississippi State head coach Ben Howland said they made the decision today to play zone defense for the first time in four games. Down a man with a short bench and knowing Mizzou had trouble shooting from the outside, it made sense. The Tigers settled for three-pointers and sometimes had open looks, but nothing would fall. Mizzou was 0 for their first 15 attempts until Terrence Phillips ended the drought. To summarize, Mizzou lost to the other 1-6 SEC team that was without their leading scorer and playing a defense they haven’t practiced in two weeks. That’s the state of Mizzou basketball. 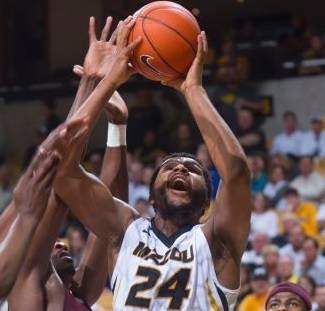 Namon Wright led Mizzou with 16 points, 6-of-12 shooting, but just 1-of-5 from three. Jakeen Gant had 11, and Phillips with 10 on just 3-of-12 shooting. The Tigers leading scorer, Kevin Puryear, was held to two points and no rebounds. Mizzou falls to 1-7 in SEC play, with Mississippi State improving to 2-6. Their last two road wins have come in Columbia.